I am now an official graduate of the Spirit Rock Community Dharma Leader Training Program. What exactly that means for me, in terms of what’s different, is yet to be seen. But one thing I’ve learned so far is that it’s good not to have a fixed view about the way things “should” unfold. 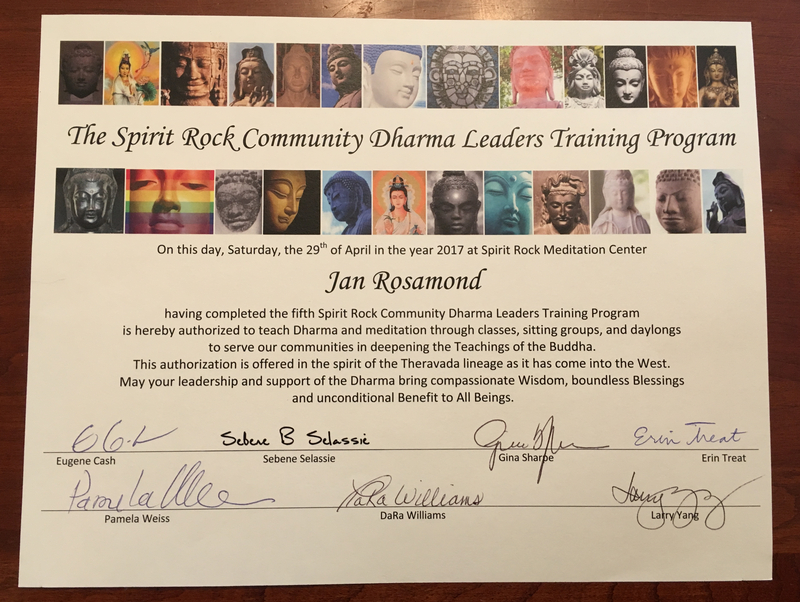 On this day, Saturday, the 29th of April in the year 2017 at Spirit Rock Meditation Center, Jan Rosamond, having completed the fifth Spirit Rock Community Dharma Leaders Training Program is hereby authorized to teach Dharma and meditation through classes, sitting groups and daylongs to serve our communities in deepening the Teachings of the Buddha. This authorization is offered in the spirit of the Theravada lineage as it has come into the West. May your leadership and support of the Dharma bring compassionate Wisdom, boundless Blessings and unconditioned Benefit to All Beings.